Ohio: With God, all things are possible. Ohio! 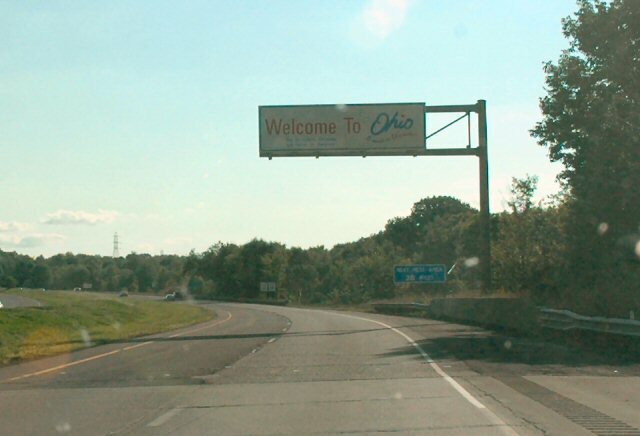 For years I had viewed Ohio as my "great white whale;" it seemed like an invisible barrier that was holding me back from exploring the rest of the country. 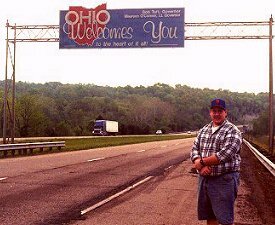 I finally made it to Ohio on May 5, 2000. I left Ohio two days later, and the time I spent until then was mostly in downtown Cincinnati, so I didn't get a true flavor of what Ohio was like. My route home took me north on I-71 to Columbus and then I-70 east towards Wheeling, West Virginia, and the Pennsylvania Turnpike. I didn't quite know what to expect, but what I saw wasn't it. Maybe I was expecting factories and suburbs as far as the eye could see. Between Cincinnati and Columbus, Ohio is very flat and the view from I-71 is that of not suburbs as far as the eyes could see, but farms. 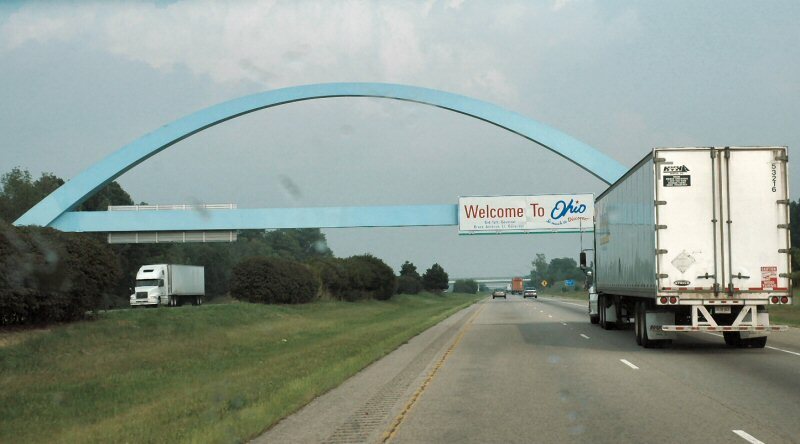 The only really big things I saw outside of the Cincinnati and Columbus metropolitan areas were a trucking company home office and an outlet mall. Other than that, that was about it. Heading east on I-70 from Columbus, I drove through about 10 miles of construction. By the time I got out into the heartland dusk was rapidly approaching and it was getting increasingly difficult to get a good idea of what the area was like. There was much more tree cover than along I-71, and the topography was a little more interesting. I guess maybe what they say is true; the anticipation of having or doing something is better than actually having or doing it. 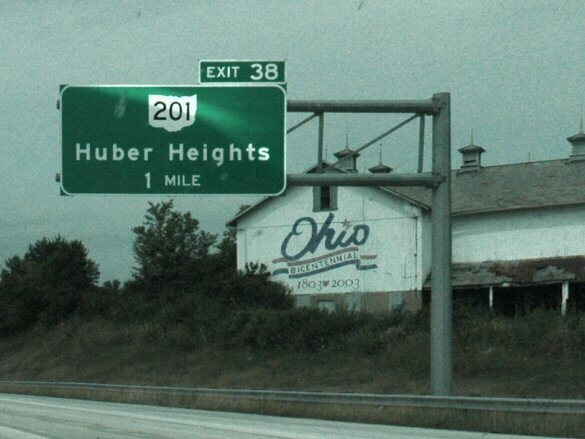 The parts of Ohio I saw outside of the major cities were on the whole rather boring. I guess I wasn't expecting it to be as rural as it was. One other thing I was wondering. On this road trip I traveled on Interstate Highways about 98% of the time. You get used to seeing the same 75-foot-high signs: Taco Bell, BP gas stations, Super 8 Motels. Then there's Cracker Barrel. From what I could tell it was a sort of antique or housewares store. You need food, fuel, and lodging to travel. Is an end table such a vital purchase that they need to pepper the interstate landscape with Cracker Barrel stores and then call attention to them by putting a Cracker Barrel sign 100 feet in the air, visible for miles? Note: In September 2002, while returning from a road trip to Montreal, I finally stopped at a Cracker Barrel about 10 miles north of Albany, New York. Cracker Barrel is half general store, half country restaurant. It was actually pretty good. 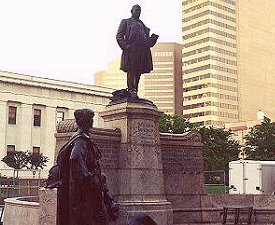 Columbus, Ohio, is the answer to a trivia question that I have never heard anyone ask. Columbus is the largest city in the United States that does not have an NFL, NBA, NHL, or Major League Baseball team. When I thought of that question I didn't know the answer. I looked up city populations in my trusty almanac, and I was rather surprised of how big Columbus is. I was also wondering what was up with my Rand McNally's saying that Columbus, and not Cincinnati or Cleveland, is the largest city in Ohio. 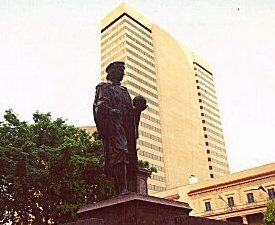 You hear about Cincinnati and Cleveland all the time, but you almost never hear about Columbus. Columbus is actually about 40% more populous than Cincinnati, with more than 650,000 residents. Like the rest of my road trip, I encountered a lot of construction when arriving in Columbus via I-71. I wound up on some city streets and found my way to Capitol Square just as a few sunshowers were passing by. 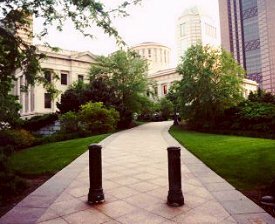 I really liked the way that the Ohio State House is situated. 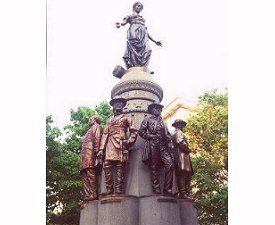 Capitol Square takes up a city block in the heart of downtown, with lush lawns, trees, statues, and other memorials. The statue of President William McKinley right in front of the capitol's main entrance is fenced off for renovation. 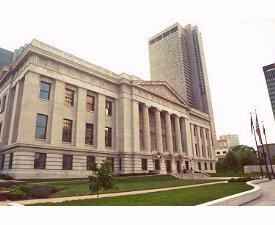 In 1989 a massive restoration project began to bring the state house up to 20th Century building codes and in compliance with the Americans with Disabilities Act. 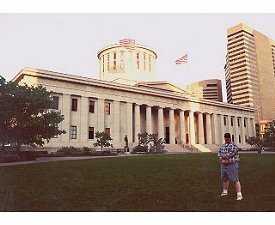 About the only thing I didn't like about the Ohio State House was the dome. I had seen a picture of it on the official capitol website so I knew what was in store for me. It almost looks like the top of the dome has been lopped off and just the base of the rotunda remains. It's a little hard to see from this angle but the top of it is a very short conical window assembly that meets in the middle. It is reminiscent of the old photographs and daguerrotypes of the U.S. Capitol in Washington, DC, from the mid-19th Century both before and during construction of the present cupola. Note: When this was written, Columbus was the largest U.S. city without a major league sports team. Since then, the NHL expanded to create the Columbus Blue Jackets and the NBA's Grizzlies moved from Vancouver to Memphis. The correct answer is currently, depending on which census figures one uses, either Austin or El Paso, Texas. This page loaded in 2.681 milliseconds.